As　Watsuji Tetsuro (2011) argues, it is faces and not phonemes (or "ideas," phaf) that substantiate, give a focus or "centre of gravity" to persons, and I would argue and groups, and in doing so, perhaps, give them existence. On Japanese television faces are used to give existence to, and communicate, other ephemerals too, such as emotions. 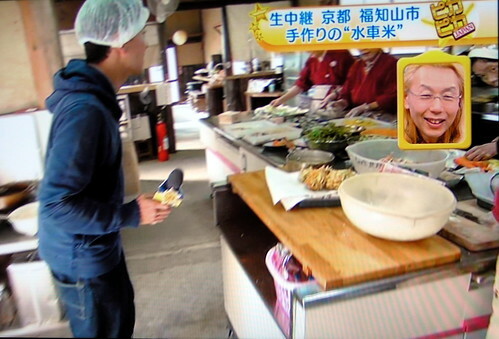 As I have noted elsewhere there are always faces peering out of Japanese television sets telling the audience how to react (see the face of a television personality smiling, top right) in what is referred to as the "wipe" (waipu). Some people believe that 'the face in the waipu' is there because the Japanese are more conformist, and less original, so they need to be shown how to react. Yes, they are being shown how to react, but no they are not more conformist. In the West, ephemeral things such as selves, groups, and emotions are given substance by words, phonemes and "vocal gestures". Indeed, George Herbert Mead (1934) argued that it is only the vocal gesture that can be used in this way since it is the only one to bounce back. Mead did not know about mirror neurons but the majority of Japanese, Noh practitioners such as Zeami and martial artists such as those surveyed by Yamamoto (2009), are unaware that they can see themselves too. On Western TV the audience is told what to think using phonemes, in the form not of words, and especially "canned laughter" and "oohs and ahs." There are some oohs and ahs on Japanese television, but I can't watch British television comedy shows any more for sheer volume of intrusive - "conform or else" - canned laughter. Give me a face in a waipu any day. I can ignore that. The preferences is personal, and cultural. The mechanism is the same. The medium is different. Mead, George Herbert. (1934) Mind, Self and Society. University of Chicago Press. : Chicago. Watsuji, Tetsuro. (2011) "Mask and Persona." Trans. Carl M. Johnson. Japan Studies Review. XV: 147-155. The vocal gesture, then, has an importance which no other gesture has. We cannot see ourselves when our face assumes a certain expression. If we hear ourselves speak we are more apt to pay attention. One hears himself when he is irritated using a tone that is of an irritable quality, and so catches himself. But in the facial expression of irritation the stimulus is not one that calls out an expression in the individual which it calls out in the other. One is more apt to catch himself up and control himself in the vocal gesture than in the expression of the countenance. It is only the actor who uses bodily expressions as a means of looking as he wants others to feel. He gets a response which reveals to him how he looks by continually using a mirror. He registers anger, he registers love, he registers this, that, or the (66) other attitude, and he examines himself in a glass to see how he does so. When he later makes use of the gesture it is present as a mental image. He realizes that that particular expression does call out fright. If we exclude vocal gestures, it is only by the use of the mirror that one could reach the position where he responds to his own gestures as other people respond. But the vocal gesture is one which does give one this capacity for answering to one's own stimulus as another would answer.